Feast your eyes on Noro's newest trio of yarns. Pattern booklets, colorful tools and other must-have stuff. Entrelac gets kicked up a notch, designs from Juniper Moon Farm, a knitter's curiosity cabinet and more. Chevrons' natural undulations are a perfect match for color-changing yarns. Twenty quick-knitting, need-them-now accessories for fall. Variegated and solid-color yarns from a dream team. Three colorways, three patterns, three totally different looks. Relaxed silhouettes, layered or on their own, take you through the season in style. 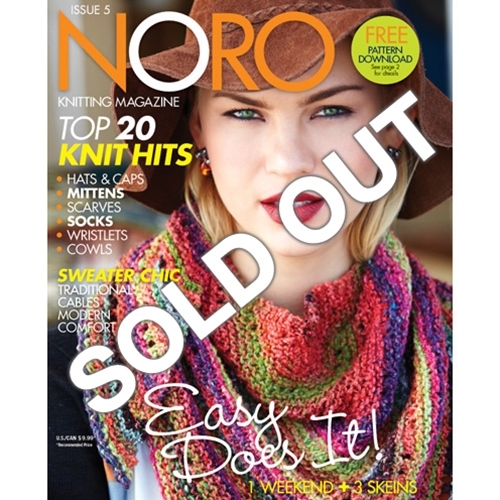 Proclaim your love for all things Noro with a spectacular heart-motif afghan. Crocheted cowls are the neck's best thing. Price includes shipping. Ships separately.